CD review: "Cool Blue Halo"
If introspective, thoughtful folk-based music was out of style in the 1970s in favor of over-the-top arena acts, the '80s have seen a return to the form. 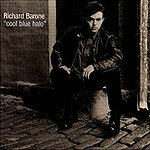 Late of the Bongos, Richard Barone is lending his distinctively nasal vocals and hard-hitting lyrical messages to the re-emerging folk-fock movement. "Cool Blue Halo" is full of beautifully moving pieces that recall Paul McCartney's melodic touch. Barone's band, consisting of cello, acoustic guitar, vibes and piano, focuses the attention on the textures of the music. In the case of "Tangled in Your Web," the result is to recall the trad folk of Fairport Convention or Steeleye Spann; his spare cover of "Cry Baby Cry" will invite comparisons to John Lennon.